I heard an explosion so I took a look outside. I saw this object in the sky. circular shape then it suddenly flew away in the blink of an eye. 30 seconds later a fighter jet came over. I have no idea what I've seen. Camera used was a Samsung Galaxy S5. "I think the object must have been about 500 meters. I'm not sure on the size but it wasn't small. My first instinct was a drone because the lack of sound, but when it flew off I am very sure it was not a drone. This thing went from 0 to insanely fast instantly. I have had a few experiences during my life. Once when I was a child I was asleep and woke up. 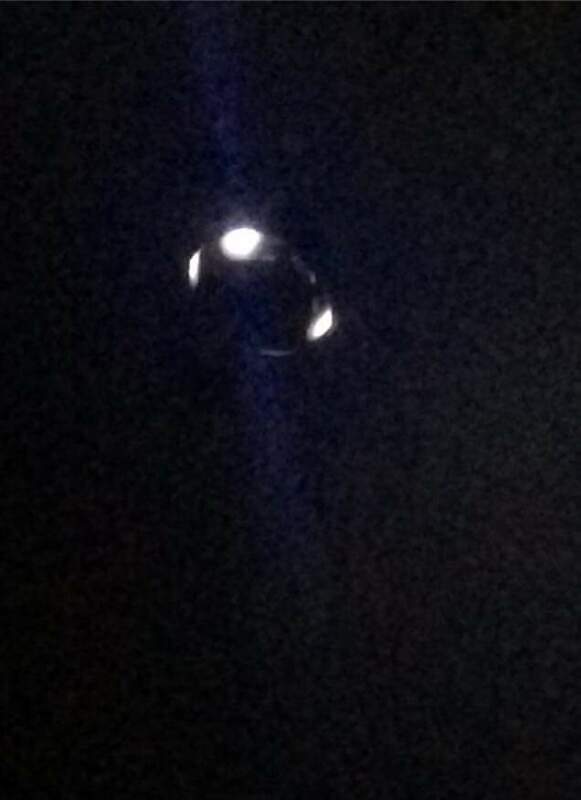 I looked outside and saw a huge flashing oval object moving slowly with several smaller ones moving faster around it. I am not sure if I was dreaming this because I was very young but It felt pretty real at the time. I also had about 2 months ago I woke up during the night and for some reason I felt the need to look around. I looked at the end of my bed and I could see a figure standing there. I didn't feel scared I felt nothing and I just went back to sleep. The morning I woke up and then it suddenly hit me what I saw I suddenly felt shock as if all my emotion at the time was delayed. 3 foot tall with a very slim neck and a large head. Grey-ish in skin, no hair with almond eyes the size of a child's hand. A mouth a bit smaller to mine and lots of wrinkles on its forehead and around the mouth area. I didn't tell my girlfriend who was next to me. I told a few people I work with but everyone thinks I'm crazy and laugh it off. I've been a bit off since then at night. I don't tend to rest easy when it's dark and I can't see much so I've resorted to a night light. My girlfriend doesn't mind because she noticed I'd get in bed with my eyes open until I fell asleep. I had a bit of light when this experience happened because I have a light in the back garden I can turn on. The experience has left me aware that I'm pretty sure we are not alone in the universe. I tell my stories but I don't expect people to believe. I'm keen to get this image out there because I know this this was not human technology. If it was it is something that's being kept secret. I would love to edit the photo to see if I could get a clearer image. You can clearly see its shape. 4 lights that look as if they may not be evenly spaced. 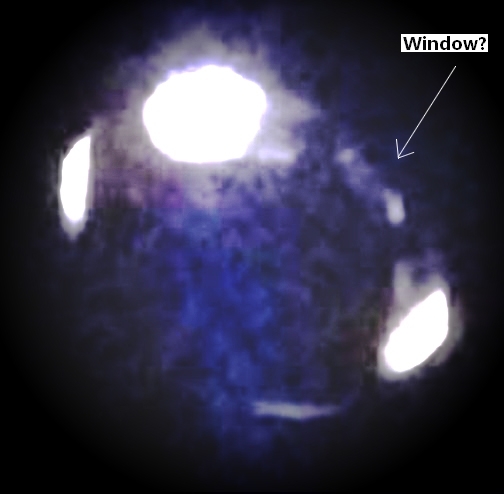 It also looks as if there is a windows of some sort but that may just be the light reflection. Anyway all the best, I'll be back if I ever witness anything else which I hope won't happen. I've seen too many things it's scary! Even ghosts! Image detail enlarged and with gamma filtering applied. Can we now even see a window on this object? ©All photographs and text on this page are the intellectual property of the witness and must not be reproduced in any form without prior, written permission from BEAMS.